We set our alarm for 7 a.m., but I woke up earlier, at about 6:30. I was full of nervous energy. The movers we hired to load the truck - Ray and Marc of Ray's Moving Help - were coming at 8, and we had some last-minute packing to do before they arrived. Everything was planned out. I had picked up the truck on Thursday, and timed it to take advantage of the street cleaning. There's no parking in front of our building from 8 to 10 a.m., so I arrived with the truck right at 10, and got the perfect parking space. 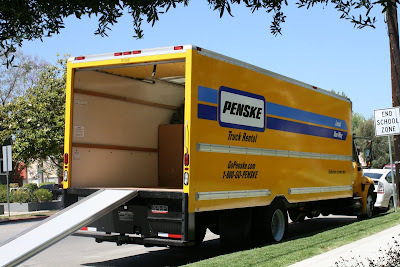 We reserved a 22-foot truck, but Penske upgraded us to a 26-footer. 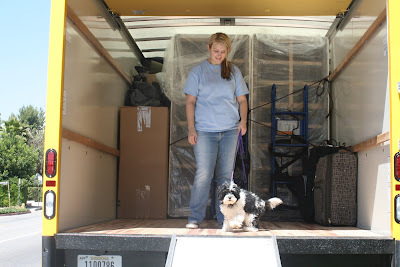 The truck was huge - bigger than we needed - but brand new, with cruise control, a CD player, the works. It seemed pretty comfortable, which is important, because this truck will be our home for the next week. 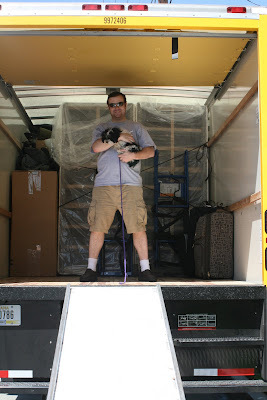 It took Ray and Marc about 2 1/2 hours to load everything we owned into the truck. It was pretty amazing - they were fast, efficient and loaded everything in nice and tight. The best 200 bucks we spent. 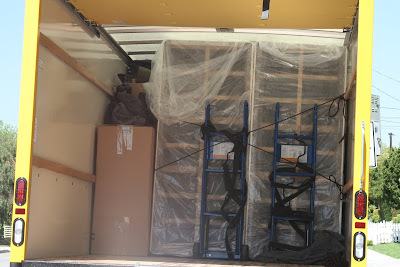 We took off at about noon, stopping at Penske to have the car trailer attached. The truck was easy to drive, but it doesn't go very fast when fully loaded. Once it gets going, it can get up to 65 or 70, but it takes a while to get there. And on an uphill, don't expect it to go more than 45 or so. The engine is loud - very loud - but it seemed to soothe Annie, our five-month-old cockapoo. She slept for much of the trip, and spent some time wandering around the cab and sitting on Nicole's lap. This drive was the shortest of the trip - only 150 miles. We're staying two nights in Palm Springs, going to a friend's wedding while we're here, then heading out for the heart of the trip - 600 miles per day for five days, New York or bust. So tune in here to hear more about the trip and observations from the road. The 26-foot truck parked in front of our apartment on Moorpark Street in Sherman Oaks. The truck is fully loaded. 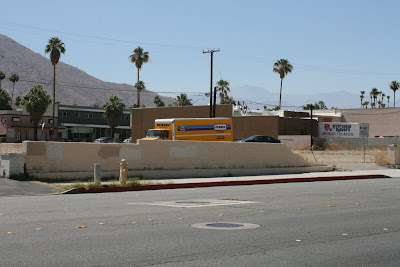 The truck is parked in an empty lot in Palm Springs, across the street from the Seven Springs Inn. 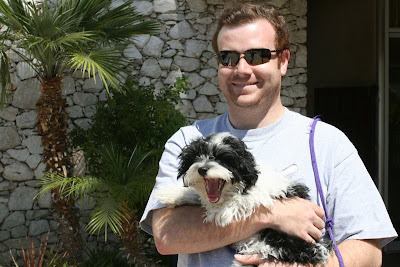 Annie yawns in Palm Springs after the first leg of the journey.